What do people do with clear glass jars? Despite the obvious – storing jams and marmalades or dried foods, here are some interesting and creative things that people do with their flint glass jars. Lisa Kettell makes use of clear glass jars to create these chic wedding jar fairies. She decorates the inside of the jars with some printed photos, labels and other decorative elements, and put a cute flower on the lid. Smart! Angie came up with these jar cozies. 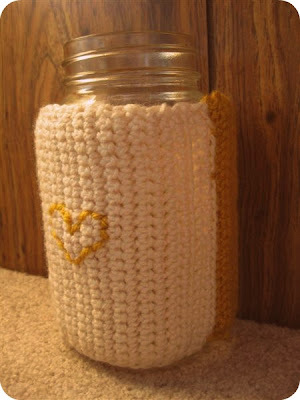 If you enjoy knitting, this crocheted jar cozy could be a nice idea for your next knitting project! Not only will the wrap make the jar looking different and attractive, it will also be great as decoration or gift for a loved one. This is a rather common idea, but still nice to adapt. Rachel Le Grand creatively uses a clear glass jar for I spy game. She fills a jar with rice and a few different small objects like dices, buttons and small toys. Pretty sure her children are very well entertained. Need some fresh ideas what to gift someone on their important day? Why not fill up a jar with something they might like? Homemade cookies, sewing kits etc. Finish it off with decorating the lid and attach a cute label. Get organized with your crafts. Use clear glass jars to store the buttons you will use in your next sewing project. They could make a great decoration too! For more ideas, check out this blog post on the lovely things people make with jars. So what do YOU do with your glass jars?